New York Costumes is the block-long costume store in the East Village of Manhattan (at 104 4th Ave). Location-wise, we are 11th street, if 11th street continued on through our block. But instead of 11th street joining 4th Ave and Broadway, we do. Most local New York City costume community people know us as "Halloween Adventure," and they then wonder where the "New York Costumes" element fits in. New York Costumes is our subtitle to differentiate us from other Halloween Adventure stores, such as our sister store in Times Square, Masquerade Costumes (311 W 43rd street). When you see "New York Costumes," you can know that that refers to NYC's original Halloween Adventure store in the East Village, going strong for over 20 years. 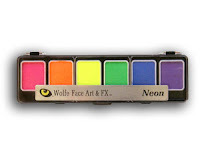 Wolfe Face Art & FX -- new in stock! 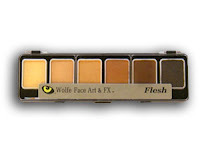 New in at New York Costumes / Halloween Adventure in the East Village are several fine make-up products from Wolfe Face Art & FX. 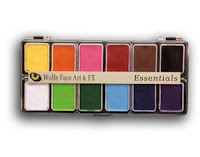 Wolfe FX is "known for its unique products and cutting-edge application techniques" (cited from Wolfe FX website). 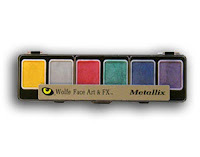 This entry will cover two new types of Wolfe FX products we have in stock: the Wolfe Hydrocolor Makeup Appetizer palettes and the FX Silicone prosthetic material. Also in stock is the FX Silicone prosthetic material. 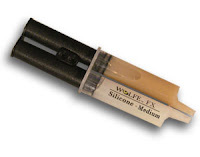 Wolfe FX reports that this product is a medically safe silicone prosthetic material that is composed of platinum silicone. It cures in less than 5 minutes and can be painted with "almost anything." It can be removed, cleaned, and reused for reapplication. It can be cast in almost any mold. And it will not break down. Visit us at 104 4th Ave in New York City to see our new Wolfe FX products with your own two eyes. Our make-up department sales representatives would be more than pleased to tell you all about their enthusiasm for the silicone FX material! Black and Light Ball 2009 - we're a sponsor! The Black and Light Ball 2009 is this coming Saturday, May 9, here in New York City! A "new era of psychedelia... part masquerade, part love parade with any form of glowy finery acceptable for this night of art, dancing and full-on black-light." Fashion and finery meets UV-reactivity at this huge dance-party spectacle of an evening. 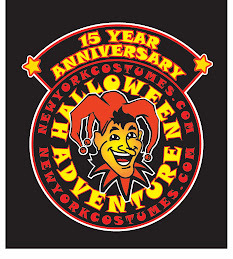 And we of New York Costumes / Halloween Adventure are pleased to be a sponsor! Break out your blacklight make-up, your purest white colored accessories, your creative style, heck even some 80s style neon anything, and join us for this occasion. On Saturday, May 9th we welcome in a new era of psychedelia to NYC and the world. An annual high-tech sendoff of Truman Capote’s Black & White Ball, BLB is part masquerade, part love parade with any form of glowy finery acceptable for this night of art, dancing and full-on black-light. Where: Undisclosed location, art gallery/ loft space in lower Manhattan. Cost: $25 via kostumekult.com or disorient.com. ($20 tix sold out). Event expected to sell out but, if not, $25costume/ $30normal at door. glow, blink or leave trailssssssss… Retro chic, future geek or time travel. The dancefloor will be hot - Less is best!